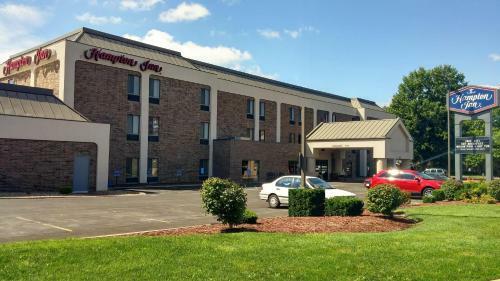 This Blue Springs, Missouri hotel is 10 miles from Arrowhead Stadium, home to the Kansas City Chiefs football team. It features an indoor pool and free Wi-Fi throughout the property. Each room at Hampton Inn Kansas City Blue Springs is furnished with a coffee maker, microwave and refrigerator. Cable TV with pay-per-view movies is available in every room. Guests can use the hot tub and business center at the Hampton Inn Blue Springs. Laundry facilities are also on site. Free access to a nearby gym is available to all guests at the hotel. Downtown Kansas City is 17 miles from the hotel. Hampton Inn Kansas City is 4 miles from Burr Oak Woods Conservation Area. the hotel Hampton Inn Kansas City Blue Springs so we can give you detailed rates for the rooms in the desired period.